A nice thing about bikes is the freedom. The rider can do whatever they like with it. For example, taking a cargo cycle off the pavement, maybe even way off the road. Its a crazy idea. Imagine taking a minivan into a mud bog: it would get stuck immediately, dirty inside and out, would be expensive to retrieve, and might be damaged by impacts, scrapes, water, even overheating of components. But on your cargo cycle, there's nothing stopping you except your level of enthusiasm. When the nose hits the mud, you stop. In the world of cargo cycles according to Ray, only those with front boxes matter, and of those there are just a few kinds that matter. Of course there is the Nihola, but also the Bullitt occupying the go-fast end of the spectrum and Christiania trikes at the utilitarian end. Also there is the Dutch angle on this, the WorkCycles Cargobike springs to mind, but its as heavy as a trike without the balance advantage, so it is best left to boring tasks on firm, level ground. This, according to Ray. A Nihola is particularly well suited to going on crazy adventures with kids. This is mostly due to two things: (1) unified frame (2) three wheels. 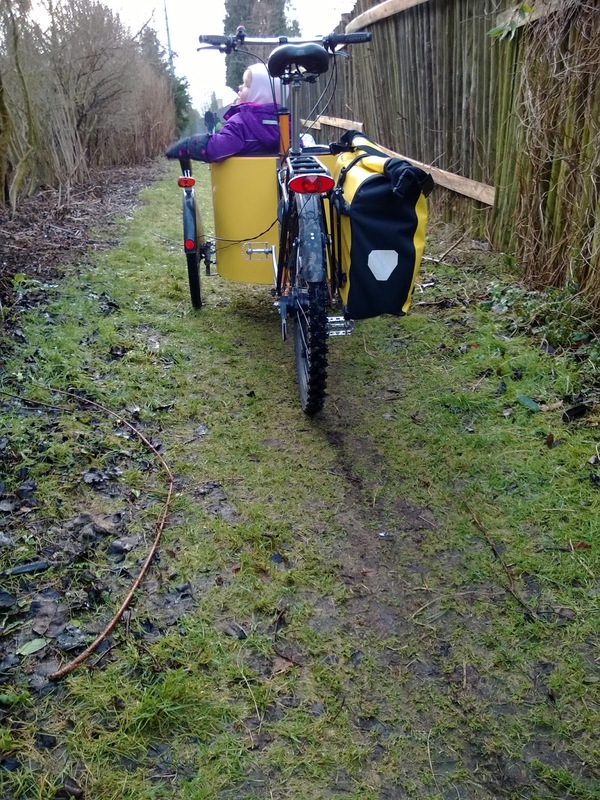 You can find larger three-wheeled conveyances (Christiania), or faster two wheeled ones (Bullitt or a long-tail), but a Nihola is (IMO) the best platform for hauling your offspring out into the local tamed wilderness in search of righteous mud. But let me quality that a bit. A Nihola is unlikely to be much fun where a mountain bike can't be ridden. The tamed wilderness should have sufficiently firm and smooth ground, moderate to mild hills, mild side-slopes, 90cm+ gaps between trees, and relatively few fallen branches. Mud, roots and rocks are OK in moderation. In Denmark, this means just about any mountain bike path I've seen, plus a lot of walking and horse paths, and sometimes the forest floor itself. So lets get started. Just how nuts can a person go on their Nihola out in the (tamed) forest with two kids up front? This will depend in part on some specifications of the Nihola in question: 1) low gearing, 2) grippy rear tire, 3) lowered inflation pressure in rear tire. Also one should not neglect to put some weight over the rear tire: snacks, water bottles, spare clothes, diapers and so on. Finally the driver needs to understand: 1) balance, 2) rocking, 3) wheel placement, 4) ground clearance, 5) approach angle. 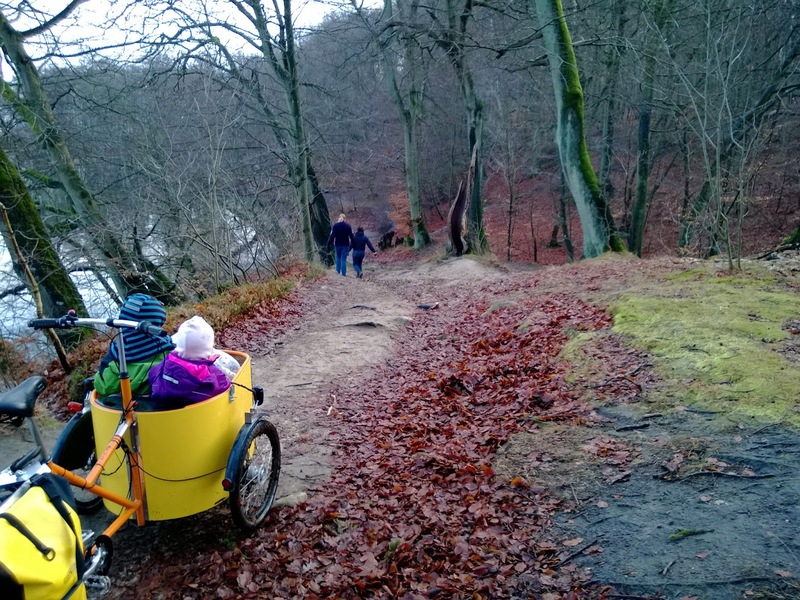 With these points in mind, with maybe 40kg of children in the box, I have gone through mud that mountain bikes avoid, up hills that mountain bikes struggle to climb, on many km's of winding paths, and gained many hours of happy children time. So to start with the mechanical side of things, a person needs low gears for the most pleasant Nihola offroading experience. I can say from experience that 15 gear-inches is a lot better than 21 gear-inches, which is a lot better than 26 gear-inches. Its also convenient if your gearing solution: 1) doesn't break into bits under heavy loads, 2) lets you roll the pedals backwards freely, 3) lets you change gears while stationary. (That's because if you start a hill in the wrong gear, you can quickly become stationary.) Shimano Nexus 8 or Alfine 8 is almost certainly the most sensible choice. If your ground surface is wet or soft, knobby tires are a really good idea. Relatively smooth tires, such as a Nihola is delivered with, give up quickly off pavement. On a hill, one can often work around a lack of traction by rolling a bit backwards downhill in order to attempt a new approach. In mud, a lack of traction leaves rocking as the only escape short of dismounting and pulling. Lowered tire pressure in back is a useful traction aid, along with some weight on the cargo rack. I suspect the Schwalbe Marathon Plus MTB is an excellent choice of tire. Either the 26x1.9" or 26x2.1" version should fit in the frame, but the fatter one will be a close call. My own experience with this comes from a 26x2.1 Nokian Extreme 294 (a winter tire), and I have a 26x2.0 Schwalbe Marathon Tour that I intend to try this summer. This thin wet grass on greasy mud would only need a little slope to stop an unprepared Nihola. But we are prepared. So to conclude the mechanical side of things, we can say there isn't a lot to do. Get the lowest available gearing, a knobby tire, lower the inflation in back, and carry something on the cargo rack for best results. (The cargo rack also makes a good handle, and should be considered essential by any serious owner.) Driver technique is more complicated. First of all, its good to keep the rubber on the road. Happily, children in the box have a powerful stabilizing effect. Not so happily, weight on the cargo rack has an opposing effect, though a less significant one. Also happily, with three wheels, the rider is free to get into positions which are atypical for a cycle of any kind. For example, I have sometimes pedaled with my behind next to the saddle, not on it. Balance downhill is pretty easy, although a few times I was afraid of tipping the whole trike over its nose, not just nose-down but entirely upside down, and so I did what I could to sit as far back as possible. Balance uphill is easy so long as there is no side-slope. An uphill side-slope renders a Nihola helpless embarrassingly easily, because the rider's weight can easily end up being outside the balance triangle formed by where the tires contact the ground. So when climbing a steep hill, the rider needs to constantly be aware of the danger of tipping. As the rider's body moves here and there while turning the pedals, the tipping risk changes. The possibility of doing all pedaling with only the up-slope foot is one reason that being able to roll pedals backwards is an advantage. Does that look like a hill? Zero of four MTB's that we saw biked all the way up it. Rocking is basically a trike-only trick, and very effective. Its not so hard. The rider throws his or her weight forwards and backwards while using the pedals to assist. This can be an effective way to "hammer" through mud and snow, in addition to being handy at stoplights. Again, pedals that freewheel backwards are helpful here. Wheel placement is important for a number of reasons. I'm not a mountain biker, but I think we can say that riding a Nihola is "technical". You go slow and pick the places where the wheels will work best. Things to consider include balancing, finding small climbable parts of the terrain, trying to have only one tire climb any obstacle at a time, avoiding crashing the steering components (under the box) into rocks, keeping the nose clear of the ground, and (depending on the gearing) arranging for the pedals to be in the right places at the right time. There is more. The approach angle of a Nihola, or in other words the steepness of slope that the nose can clear, is a point of interest. The nose of a standard Nihola sticks out pretty far (though not as far as the 4 seat model). Its a common place for me to loose paint, sometimes even in civilization. In the forest, if the nose hits the mud, its like a ship running aground. Dismount and pull. At one point I wanted to get a round-box Nihola, which has no protruding nose, for the purpose of driving in the forest with the kids. That model is generally intended for older people who have difficultly with balance, so there would be some irony in mountain biking with one. So, where does all this leave an adventurous Nihola rider? Its still harder to take the kids onto the mountain bike trail than it is to take just yourself. With two kids, a person could easily end up pedaling 60kg more than they would solo on two wheels. You probably don't want to be on a trail with long uphills. Some trails are easy, some are fun, some are really a pain, you'll know when you try. Regardless of that, kids will likely have a good time. Oh, and wear your rubber boots. A rest for the weary. Pleasant tour with two kids.